Stuffed Breakfast Tomatoes — Pip and Ebby - easy, delicious recipes! Tomatoes stuffed with breakfast ingredients is a delicious dream come true! I could eat these every meal of every single day of my life! I get nostalgic when I think of tomatoes being stuffed with any sort of anything. My mother often made stuffed tomatoes for me growing up. 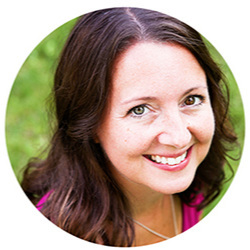 Her stuffings ranged from meat to cottage cheese to many different types of salads. Sometimes I wish I could be a kid again for the sole purpose of eating all of my mom's wonderful creations. One thing my mother never did was use breakfast foods as a stuffing for tomatoes. At least not that I remember. So I thought I would give it a try myself! I have to preface this recipe by saying that it is so incredibly light and healthy, yet insanely tasty. My husband bit into thinking it would not be the most flavorful thing he's ever tasted, but he was pleasantly surprised. Hollow out 2 large, ripe tomatoes. Do this by cutting a large circle into the top of the tomato and removing the core. With a spoon or a knife (I used both), carefully scoop out the ribs and seeds. Leave the walls of the tomato intact as best you can. With your finger, rub half of the mixture onto the inside of one tomato, covering the inner walls as thoroughly as possible. Rub the other half of the mixture onto the inside of the other tomato. Set the tomatoes aside. In a skillet, heat 1 tablespoon of olive oil over medium heat. 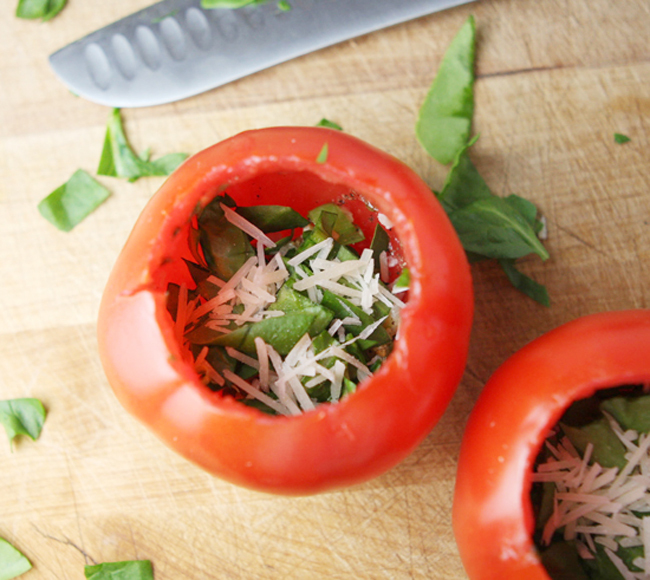 Divide the green onion mixture in half and place into the bottoms of the 2 hollowed-out tomatoes. Top that with a layer of finely chopped fresh spinach. I used approximately 1/4 cup between the two. And top the spinach with a layer of shredded Parmesan cheese. Squish as much cheese in as you can, keeping in mind you need enough room for 1 egg. You'd be surprised how much you can fit into a tomato. Carefully crack an egg into each tomato. If you want to make sure you don't break the yolk, crack it into a bowl first and then pour it in. Place the tomatoes onto a greased baking sheet and bake in the preheated oven for 25-30 minutes, or until the egg is cooked through. Sprinkle the finished product with Parmesan cheese and fresh parsley and eat immediately! Mom, I'm making these for you the next time I see you! Check out a few of my other delicious tomatoey recipes here: Tuna Salad (stuffed inside tomatoes! ), Tomato Salad with Avocados and Onions and Triple-Decker Baked Italian Cheese Sandwiches! I LOVE stuffing my breakfast into the shell of a delicious tomato! Preheat oven to 350 degrees F. Cut a large circle into the top of each tomato. Remove core, stems and seeds, leaving the wall of the tomato intact. In a small bowl, combine the salt, pepper and 1 tablespoon of parsley. Rub half of the mixture onto the inside wall of one tomato and the other half onto the inside wall of the other tomato. In a skillet, heat the olive oil over medium heat. Add the green onions and garlic and cook until soft, about 5 minutes. Divide the mixture in half and place into the bottoms of the tomatoes. Divide spinach in half and place over top of the onion-garlic mixture. Divide the Parmesan cheese in half and place over the spinach. 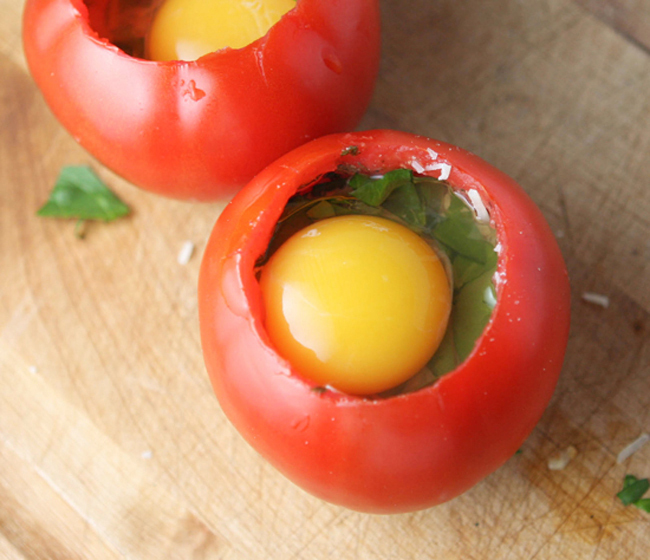 Crack a raw egg into each tomato as the top layer. Place tomatoes on a greased baking sheet and place in the preheated oven. Bake for 25-30 minutes, or until egg is cooked through. Top with shredded Parmesan and fresh parsley and serve immediately.